Federal health officials have a bit of a mystery on their hands. A Salmonella outbreak linked to imported cucumbers is continuing to grow even though the products identified as the source of the outbreak were recalled from the market more than two months ago. Cucumbers have a shelf a life of about two weeks and symptoms of a Salmonella infection usually appear within six to 72 hours of exposure. So, health officials aren’t sure why new illnesses continue to develop. Two recalls have been issued for cucumbers linked to this outbreak. The first, on September 4, 2015, by Andrew & Williamson Fresh Produce for cucumbers sold under the “Limited Edition” brand label during the period from August 1, 2015 through September 3, 2015. The second on September 11, 2015 by Custom Produce Sales for all cucumbers sold under the Fat Boy label starting August 1, 2015. Those unlabeled cucumbers, which were sold in Nevada, were sent to Custom Produce Sales from Andrew & Williamson. In addition, the U.S. Food and Drug Administration (FDA), which traced the cucumbers to Rancho Don Juanito de R.L. 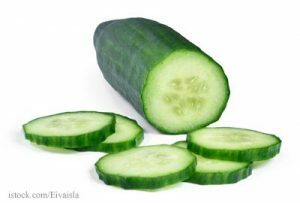 de C.V. in Baja, Mexico, issued two issued import alerts in September essentially banning those cucumbers from entering the United States. The Centers for Disease Control and Prevention (CDC) reported yesterday that 838 people in 38 states have been sickened, 165 have been hospitalized, four have died. Since the last update on October 14, 71 new illnesses from 23 states have been reported. These are not newly reported illnesses that occurred previously but have recently been ruled part of the outbreak. They are new illnesses with onset of symptoms reported as late as November 4. The outbreak now also includes two new states Connecticut and New Hampshire. Public health officials used DNA “fingerprinting” to identify three outbreak strains of Salmonella Poona associated with this outbreak. Those strains were also found in cucumbers collected from retail locations and in samples taken from the Andrew & Williamson facility. The recalled cucumbers, dark green in color, between 7 and 10 inches long were sold unlabeled in bulk displays at grocery stores. A list of retailers that sold the recalled cucumbers has not been provided by health officials. But Walmart, Winco, Food 4 Less, Ralphs, and Savemart stores all carried them. Some restaurants also served them, including Red Lobster locations in Minnesota. By state the case count is as follows: Alabama (1), Alaska (17), Arizona (129), Arkansas (13), California (232), Colorado (19), Connecticut (1), Florida (1), Hawaii (1), Idaho (24), Illinois (9), Indiana (5), Iowa (7), Kansas (2), Kentucky (1), Louisiana (5), Maryland (1), Minnesota (40), Missouri (14), Montana (16), Nebraska (8), Nevada (16), New Hampshire (1), New Mexico (32), New York (6), North Dakota (8), Ohio (3), Oklahoma (13), Oregon (22), Pennsylvania (2), South Carolina (10), South Dakota (3), Texas (42), Utah (58), Virginia (1), Washington (25), Wisconsin (43), and Wyoming (7). Fifty percent of the case patients, who range in age from less than 1 year to 99 years old, are children younger than 18. The fatalities were reported from Arizona (1), California (1), Oklahoma (1), and Texas (1). The investigation is ongoing.